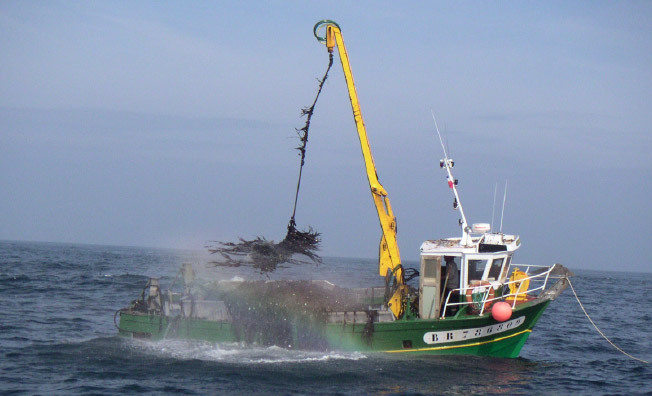 It is in the Iroise Sea, classified as World Reserve by UNESCO, that AGROCEAN harvests the LAMINARIA DIGITATA seaweed. Large brown algae of the Phaeophyceae family, the Laminaria digitata is never emerged as it grows by 5-10 meters deep. Water quality and permanent movements guarantee the exceptional quality of this resource. Heritage of centuries of tradition, the Laminaria is harvested by a fleet of 60 specially equipped boats with an articulated hydraulic arm called scoubidou. This harvest is limited to a period from May to October to allow regrowth of the algae, thus ensuring good management of the resource.